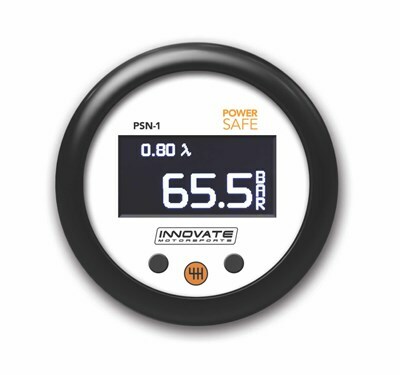 All-in-one, Nitrous safety override and wideband air/fuel ratio gauge w/RPM window switch.52mm (2 1/6”) diameter gauge body. OLED user configurable display for: Nitrous bottle Press, shift light, air/fuel ratio, AFR or Lambda, inHG, PSI, kPa and BAR.1500 PSI nitrous bottle pressure sensor. No warranty on the Lambda Sensor. 52mm (2 1/6”) diameter gauge body. Interchangeable faceplates and bezels: Black and silver bezel, black and white faceplates included. No PC required for configuration. OLED user configurable display: Nitrous Bottle Press, shift light, Air/Fuel ratio, AFR or Lambda, inHG, PSI, kPa, or BAR. 1500 PSI nitrous bottle pressure sensor. User programmable nitrous safety cut using Air/Fuel ratio and bottle pressure references: Nitrous cut by lean air/fuel condition, Nitrous cut by minimum bottle pressure. User programmable RPM window switch range, 10 RPM increments. 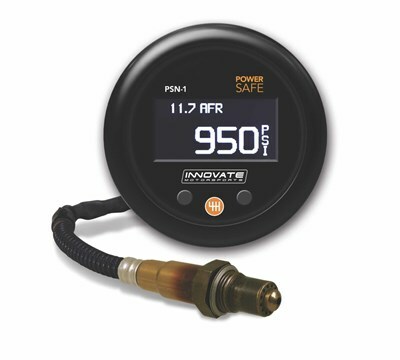 Patented DirectDigital wideband sensor control, the only 100% digital wideband air/fuel ratio technology. Wideband O2 compatible with several fuel types (Leaded, Unleaded, Diesel, E85 & more). Ability to calibrate O2 sensor for maximum accuracy. Configurable linear 0-5v analog output for wideband O2 for use with piggy back or standalone ECU’s as well as external data loggers. Innovate MTS serial in/out (for use with other Innovate & 3rd party MTS enabled devices to add additional logging channels.